Restoring your Grand Wagoneer? 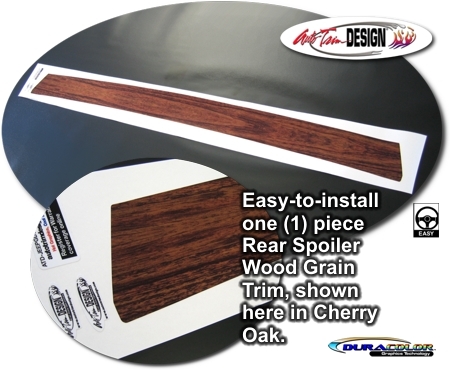 This one (1) piece easy-to-install Wood Panel Graphic Trim kit is created specifically for the '81-'91 Jeep Grand Wagoneer Rear Gate Spoiler and looks great when applied. The wood grain print is captured in this high-definition digital print. Digitally printed with our DuraCOLOR graphic technology, kit is manufactured with premium automotive grade vinyl film materials. As a further step, graphic is covered with a 2.5 mil clear laminate which provides protection from miles of abuse and allows the graphic component to be covered under an Oracal OCS6 Six (6) Year Limited Outdoor Warranty. Available in Cherry Oak or Marine Teak, trim kit is precut and ready to apply (slight trimming required for Spoiler screw holes).